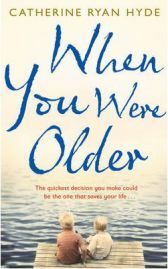 When You were Older is the fabulous new novel by Catherine Ryan Hyde. Set against the backdrop of the 9/11 terrorist attacks, it tells a poignant and moving tale of family and prejudice. I loved this book from the moment that I first picked it up and I hardly wanted it to finish. Russell Ammiano should have died on September 11th 2001. In fact he would have died had it not been for the phone call that informed him of his mother’s death and the need for him to return home to his home town in Kansas to sort out care for his mentally disabled older brother, Ben. Taking that call prevented him getting to his office in the twin towers for the scheduled 8.30 am meeting. Some might call him lucky but obviously dealing with the death of his mother who he had not seen for six years and finding out what it is like to live with Ben, a creature of habit, on a daily basis is not easy. Disorientated and confused, Russell attempts to adapt to a new way of life which centres around Ben and his rituals. His only solace is the daily visit to Nazir’s Bakery and especially his chats with Nazir’s daughter Anat. As their friendship blossoms, Russell is very disturbed by the amount of prejudice that is displayed towards her Egyptian family particularly in the wake of 9/11. Then after a local man is killed in the ensuing war, things really take a catastrophic turn for the worst which Russell is devastated to find Ben at the heart of. I’ll say no more about the story line only that it is brilliant and one that absorbed me all the way through. I think that When You were Older is a beautifully written book that is typical of Catherine Ryan Hyde’s gentle style. She is a wonderful story teller who creates characters that you really start to care about. There were moments when she genuinely surprised me because of the direction of the story and there were others where she had me in tears. When You were Older is also written in a very interesting way. The first few chapters are set during the days immediately after 9/11 but they go backwards in time starting on the 15th September. This enables the reader to piece together the story in quite an interesting way. The middle part of the book goes back in time about twenty years and provides glimpses of Ben and Russell’s childhood. This is fascinating as one reads the events that led to Ben, previously a typical domineering older brother, becoming disabled and forever having to live with the mind of a child. I found the relationship between Russell and Ben particularly poignant and couldn’t help but be reminded of Tom Cruise and Dustin Hoffman in ‘Rain Man’. Don’t think that this is an imitation of that story though, as it is much more. When You were Older is particularly moving because of the time it is set. I think that Catherine Ryan Hyde very cleverly demonstrates the unease and mistrust that was abundant in multi-cultural America at that time. This made it a sometimes disturbing read but this also made it compelling. Overall this is a wonderful book that I wholeheartedly recommend. Thanks to Doubleday for providing a review copy. 2 Comments on "When You Were Older"
I am torn between reading this story and not reading it. My brother should have died in 9/11 but didn’t. I will read it because I love Catherine’s books.